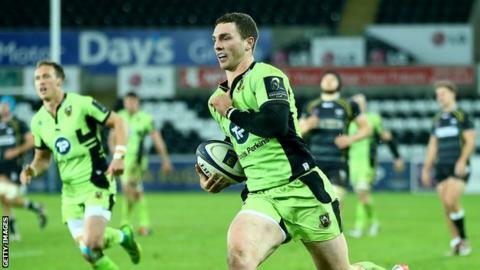 Northampton director of rugby Jim Mallinder says Wales head coach Warren Gatland is playing "mind games" with his comments about George North. Winger North is having a period of rest after a series of concussions, and last week Gatland said he was "hugely worried" over the 23-year-old's health. Gatland has also stated his preference for North not to play until the World Cup later this year. "We know what Warren's like. He enjoys a few mind games," said Mallinder. "That's Warren. He's looking after Wales, and looking after himself. What we've got to do is make sure that we look after George North, he's our number one priority. And that's what we will do. "He [Gatland] is looking after Welsh rugby and looking after their side of things. We are not interested in that, we are interested in the player's safety. We'll make sure that's right and if that's right and if we then decide to pick him, then we will do that." North says he is now free of concussion symptoms after four head injuries in five months. And although he will not feature against Leicester on Saturday, Mallinder believes he could be ready to return before the end of the season, with the Saints having already secured a place in the Premiership play-offs. "It's a possibility but nothing is guaranteed. What we have to do is see what's in the best interest of George North; he's number one and the team comes second. His health is paramount. As long as that is right we will look to select him," Mallinder told BBC 5 live. "First of all he's got to be healthy, and then we've got to consider whether to put him back in the team. If he is fit then we will have to make some selection decisions after that. "He's doing well, he's improving, but he won't play this weekend, it's still too early to play." And Mallinder insists he will be guided by his medical team when it comes to North's return to fitness. "We've said that all along, that's a specialists' thing."